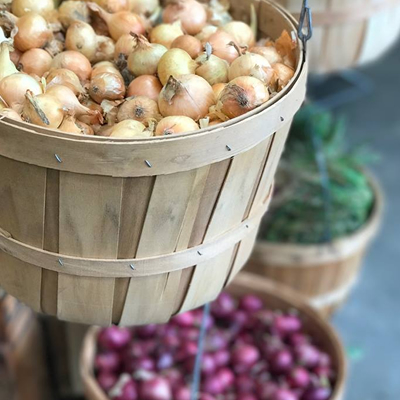 Onions can be grown from seeds, sets (small bulbs) or transplants. Sets and transplants are easiest. Planting can begin in early spring as soon as the soil is workable. Soil should be loose, rich and well drained. If planting sets, push them just under the soil so the point of the bulb is visible. Sets and transplants should be spaced 4-5 inches apart (closer if you want to harvest as green onions). Full sun & regular water. Onions have shallow roots and need moisture close to the surface. Feed plants regularly. When most of the tops have begun to yellow and fall over, dig bulbs and let them dry on top of the ground for several days. Cover bulbs with tops to prevent sunburn. Once the tops and neck are fully dried, pull off the tops and remove dirt. Bulbs can be kept in a dark, cool space.